Maybe I’m dense, but I fail to comprehend the uproar about insert cards such as the ones below. If you don’t like the cards, really, don’t buy them. They’re not part of the base set. It’s no more a gimmick than any other insert card. And frankly, I’d rather see an insert of a vice-presidential candidate than your run-of-the-mill superduperhypermegarefractorexpealadocious. There are too many people as it is who are so politically uninvolved and detached from their civic duties that they can name the 38th, 39th, and 40th man of their favorite baseball team yet haven’t the faintest whisper of a notion who it is that runs their federal, state, and local governments. 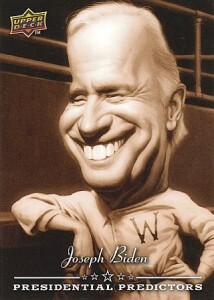 If throwing Sarah Palin, Joe Biden, John McCain, and Barack Obama cards into packs of baseball cards is what it takes to get the average person familiar with these people, then it’s a worthwhile task. It’s meaningful, and not at all the gimmick that so many are trying to write this off as. You know what’s a gimmick? Having nearly infinitesimal parallels of the same card in the same set. I don’t want 17 different versions of a Ryan Theriot Baseball Heroes card — he’s not a Baseball Hero, and what the heck is the point of all these parallels? I digress. I happen to LOVE the politically-themed inserts this year. I don’t love that they’re short-printed, thus creating artificial demand. But what I thoroughly abhor is all the hand-wringing about them. Seriously, get over it. They’re baseball cards. Bigger fish to fry, you know? « No matter what happens in the NLDS, I just don’t want to see this happen again. Wow, really? You saw that as an uproar? 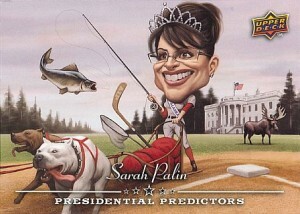 I just found it odd that Upper Deck couldn’t find a baseball player theme for Sarah Palin, and used that to satirically suggest a political bias for or against Palin, depending on your views. Really, I just wanted to see a better designed card from Upper Deck. 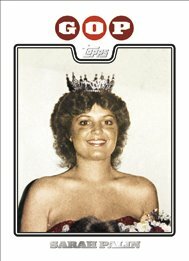 I hadn’t seen the Topps card, though.